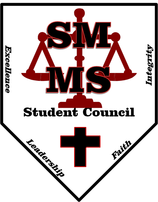 We, the elected representatives of St. Mary Middle School, will work together to be joyful missionary disciples of Christ, helping to create the best possible Catholic school community. 4. To provide a forum for student ideas. Any student government member who is at school the day of a meeting but chooses to not attend will be marked unexcused. Any member with three unexcused absences will be asked to step-down from student council. Students who are absent, on a field trip or other school or Parish sponsored activity will be marked with an excused absence.